Surprising as it is, in the final tally it seems John Constantine's immediate post-Flashpoint adventures may turn out to have been the best of those since his return to the DC Universe proper. Constantine: The Hellblazer Vol. 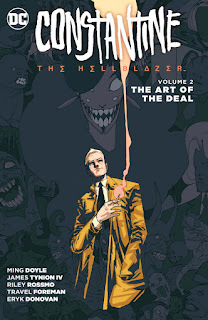 2: The Art of the Deal cements the "DC You" iteration of the title as failing to live up to our Vertigo-esque expectations; Ray Fawkes's Constantine series previous might have been perhaps too superhero-esque, but at least it was at moments genuinely scary. Ming Doyle and James Tynion's Hellblazer has been largely a series of heist stories, often semi-comedic; Simon Oliver's Rebirth special that ends the book looks to continue this tone. Given that, I probably won't be running to read the "Rebirth" The Hellblazer; I'm not getting what I want from these John Constantine books and so it's probably time to be done for a while. Doyle and Tynion pen a story that in the broad strokes will be familiar and comfortable to John Constantine fans, namely that Papa Midnite arrives in the role of Constantine's "frenemy." Equally Art of the Deal does well in tying up the series as a whole, with a major role for Blythe, Constantine's demon paramour from the first issue; the series comes full circle. At the same time, Constantine and Midnite's attempt to overtake a demonic nightclub is immediately reminiscent of when Constantine and Blythe tried to do the same thing just a dozen issues earlier. The writers re-imagine major DC Comics demon Neron as a foppish figure intending to corrupt the souls of New York through commerce (and who also, with a prescient wink and nod, wants to "make Hell great again"). There's a reoccurring theme of demons as entrepreneurs throughout the series that's problematic; at the point in which Neron is presented with ridicule, or Papa Midnite paces and wrings his hands over the vengeance Constantine might wreak, the villains stop being scary. There's minimal danger and minimal threat -- one even senses the endangered children will be OK in the end -- and that means minimal suspense, and horror is nearly nonexistent. That's not what I want from a John Constantine story, and despite the positive re-establishment of Constantine's bisexuality, ultimately in regards to the horror Fawkes's Constantine now seems closer to Vertigo's Hellblazer than this. Constantine's relationship with restaurateur Oliver is for me the main thing that makes Constantine: The Hellblazer not totally passable, and in part their relationship is so riveting because of its normalcy. Oliver is barely perturbed when Swamp Thing arrives in Constantine's shower (launching a monster-of-the-week story that's really where this book ought to have gone), befriends Papa Midnite's snake-rooster that keeps him captive, takes it as a matter of course when Constantine goes off to save New York, and then follows along behind as backup. It's almost ludicrous -- if the grungy Constantine and strapping Oliver didn't make such a cute couple -- only explained very late in the story when we understand Oliver believed he was dating one of those "super types." Common awareness of superheroes is expected in a Superman comic, not so much in a Constantine story, and so Oliver's motivations are jarring when I guess we were supposed to have been intuiting them all along. Art of the Deal's meandering works sometimes better than others; ten pages on the land of Faerie for the end's quickie payoff doesn't quite seem necessary, whereas Constantine's one-issue jaunt to Los Angeles is the book's best chapter. Not only is there simple joy in seeing Constantine out-of-place in sunny LA (one of the rare times this book surprises), but the issue involves a four-page conversation with an angel and some amusing Deadman antics. Perhaps because Animal Man's Travel Foreman's art is sketchier and less animated in parts than series artist Riley Rossmo, the issue takes on a more thoughtful tone befitting its discussion of place, and it's a seriousness I'd have preferred to see elsewhere in the book. Though it seems just about every Rebirth special that can be collected is being collected in the last "DC You" trades now, the Hellblazer special isn't listed in the contents nor on the back, so its arrival at the end was a pleasant surprise (I am enjoying the presence of these sneak peeks more than I thought). The new team brings credibility in that Simon Oliver wrote a Hellblazer spin-off miniseries and Moritat's art has gritty realism befitting the book's take on London. But again the book features a rather silly demon, and despite a wise color change by Moritat and Andre Szymanowicz that signals the book's darker moments, the story's not scary per se. Equally Constantine's swift, easy con, and the "Constantine sacrifices people for the greater good" twist are all too, too familiar at this point -- we just saw plenty of it in the "DC You" series -- and in those ways Hellblazer: Rebirth wasn't enough to make me want to try again so quickly. I don't mind John Constantine joining the DC Universe, but it's been a couple years now and I'm surprised frankly that no team has managed to bring the Vertigo Hellblazer aesthetic to his title. Sadly, Constantine: The Hellblazer Vol. 2: The Art of the Deal is not it. I'd as soon see DC shift the new The Hellblazer to under the "Young Animal" imprint or something similar; if the limits of language and content can really come off, maybe then we'll get the Constantine I've been looking for. IMO, the best "Constantine in a superhero universe" comic didn't actually have Constantine in it -- it was Marvel's HELLSTORM. DC could do a lot worse than emulating that series as a basis for their nu-HELLBLAZER comics.